Concerned about energy efficiency? Being concerned with the parts of your air conditioning system can be a first step. Do you notice the little things? I think that it is easy to not realize the damage being caused and the consequences of that damage. When we speak of energy efficiency, people think about insulation and “cash for caulkers”. Most wasted energy in our home is due to inefficient motors, but we do not discuss that idea. Another energy waster is damaged equipment which can no longer function as it should. The biggest energy wasting system in a Houston home would be the air conditioning system for cooling. Motors play their part, but the quality and condition of the equipment is also vital. I wanted to share this photograph with you, because this is such a common sight that homeowners do not acknowledge as a problem. The AC compressor suffers from lawnmowers and weed eaters. It suffers from people carrying objects past it. People bump their equipment into the unit without a thought. How could we hurt the efficiency? The house is still cooling right. What you are seeing in the photo are the fins of the compressor. Those that are in good shape are darker in color. Then you see the bent fins which are silver in color. To understand why this damage causes energy inefficiency, we have to understand what is happening with the unit. The refrigerant is passing through copper tubes in the compressor. Copper is great for heat transfer. The heat from the home is dissipated by pulling air across the tube, and then out of the unit. When the compressor is on, you have the fan blowing this hot air out of the top. As I said copper is great, but we really want to get as much heat out of the refrigerant that we can. The fins are plates attached to the tube. The heat in the refrigerant goes to the copper tube wall, and is then transferred to the larger surface area of the fin. The air from the fan motor passes across these fins, taking the heat away in the air. 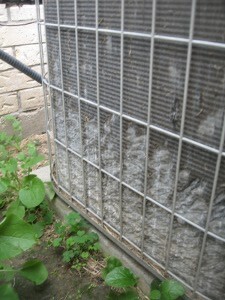 The refrigerant cools down, and then goes to the evaporator coil in the other part of the air conditioning system. If the fins are damaged, this heat transfer becomes inefficient. The system has to work harder to compensate. More work equals energy inefficiency. A little damage does not mean much, but this photo shows a unit that has more serious issues. Could the unit work? Yes. If you do not mind spending more money to cool the house. What is the solution? This set of fins could be replaced, but I am not sure that most of HVAC technicians would do that. To be honest, a new compressor with a more efficient motor is the bes option if you are looking to improve your overall energy efficiency. You do not absolutely have to replace the evaporator coil, but the evaporator coil and compressor have to work together, so ask if they are compatible. If you have a little damage, avoid causing more. If you go out and check your unit, only to find something that looks like this picture, then plan on a new unit to improve your energy efficiency. Considering how much the cost can be to cool your home in Houston, you may recover the cost of a new unit fast (he says smiling). This entry was posted on Wednesday, December 15th, 2010 at 11:30 am	and is filed under For the Homeowner. You can follow any responses to this entry through the RSS 2.0 feed.